These are Zen meditations for modern times -- cold comfort, maybe, for some of us who might want platitudes and the promise of peacefulness being handed to us on a silver platter. Because, as Shaw points out, conflict is a part of life. Zen Buddhism was even founded in conflict. No one can give anyone else peace. Peace comes to those who seek it -- in the moment and for the moment only. The pace of lives continues to accelerate, though, with more and more demands being placed on us by both others and ourselves. This collection, aimed at gaining inner peace, is wonderfully suited to the breakneck pace of our lives today. The future is too full of work, laundry, family, and other commitments -- not to mention the unknown. The past is gone. There's no time like the present to make like the eye of the hurricane and choose to be at peace with ourselves. The 108 meditations in this book offer a very contemporary respite from internal and external conflict. Their number and their form, however, is steeped in tradition. One-hundred-and-eight is a sacred number in Buddhism, where there is also the tradition of meditating with malas -- strung beads, which come in multiples of nine -- 27, 56, or 108. Their form follows Buddhist tradition as well -- they're modern koans, or riddles to ponder, and dharma stories. 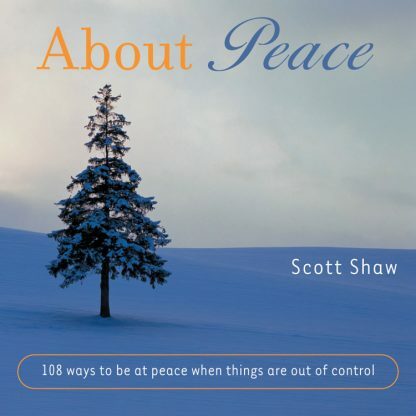 Scott Shaw is an accomplished martial artist and practicing Buddhist. He is the author of several books, including Zen O'Clock, Samurai Zen, Ki Process and Tao of Self Defense.